Everyday that you try to exercise there will be a million other things that you could, should, and want to do. Guest bed buried in laundry today...and many days. The fear of being interrupted, the inconvenience of actually getting dressed in workout clothes (don't forget Trick # 1! ), a work call you have to make, that laundry you need to fold these things stop us in our tracks. They give legitimacy to our procrastination. Our lives are demanding, so we put off working-out until later...and later...and later....months, years can go by and those hindrances are still there in one form or another and we're still not exercising. Exercise is never going to be super convenient. I'm going to teach you how to be as efficient and low-tech as possible to help you make it happen AND get results. Even with that help, you will have to create space in your home, your life, and your mind. Maybe you want to be healthy and you want to do it in a way that is realistic for your life. Or you already know the excuses and the legitimate reasons you have for not exercising, but you also know that you need to make it happen, and you're not exactly sure how to do it. Or just "staht", as we say in my middle class New England family. When I'm tired, crunched for time and I have lists upon lists of things that I need to accomplish I say to myself, "Just start the workout and see where it takes you," and 7 out of 10 times, I finished it and felt better for having exercised. Other times, maybe I got 5, 10 minutes in before being interrupted by life, but it was better than nothing AND by just starting that mini-workout, it was easier to "just start" the next time I needed to. 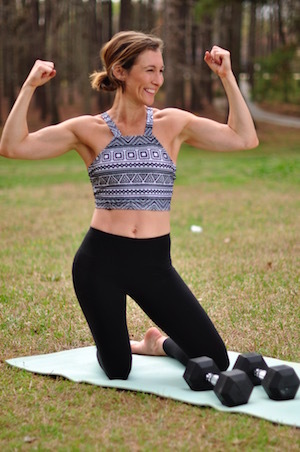 Six months after having my first baby, I started attentinding a workout class with other moms who supported one another in fitness, motherhood, and life. I knew it was good for me, and I felt bad when I missed a class, but sometimes with a new baby and the exhaustion, I just couldn't imagine myself getting there and THEN working out for an hour. So I started trying to just get there. I gave myself the permission to do it as IMPERFECTLY as necessary, to stop if I needed to...and sometimes I even left early. Having that freedom made me feel in control of the process, this was also the beginnings of my cultivation of a #persistenceoverperfection of #pop mindset!! No one was forcing me to workout, I made the choice and some days I chose to stop because I needed the rest. I needed to be gentle. Oddly enough, this gave me the power to start the workouts and more often than not, push through to the end. After that, I used this same approach for attending other exercise classes, getting to the gym, and I found that my attendance was even better than it had ever been. Maybe for you, it's not about workouts. You're not even there yet. You're not sure how to "just start" because you don't even know how to work out. For you, it's more like taking that first step towards living better? If that's the case then I am happy to tell you, you're already doing it. By reading this post, you're seeking, researching what to do next. Find people online (like myself) and in person that inspire you to make good choices, to learn what good choices look like in your life. These folks will help you be accountable to the commitment you wish to make. Start using the mantra, #persistenceoverperfection!! Every baby step you take towards creating habits of wellness in your life, the closer you get to looking and feeling better and the easier it becomes to live your live health-full life.